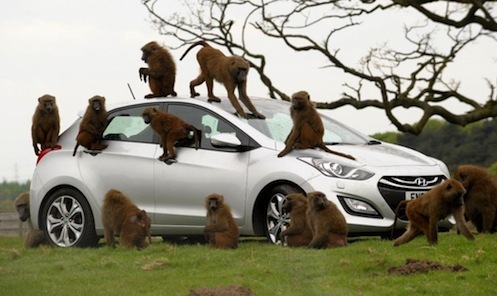 Hyundai took their i30 Hatchback into a baboon habitat to test the durability of the new five-door compact car. In a first ever test of its kind, Hyundai took their i30 hatchack (the Elantra GT here in the U.S.) into the Knowsley Safari Park in the UK for an incredible durability test. Hyundai decided that there is no better way to test the durability of the new hatchback. They drove the five-door compact car into the baboon habitat, opened the doors and stood back and let 20 monkeys do whatever they wanted with the car. As visitors enter the baboon habitat, they are greeted with a warning that says “You enter at your own risk. Baboons can damage your car. We advise you to keep moving in this area.” After you watch the video, you will see why. The monkeys leave nothing untouched and left the car a filthy mess. Felicity Wood, who is the i30 Product Manager in the UK, was a little nervous with the experiment and didn’t really know what to expect when the baboons were let loose on the car. She found out that the monkeys may have done a bit more to the car than they had anticipated. David Ross, who is the General Manager of the Knowsley Safari Park, said the baboons pulled off the windshield wipers, mirrors, windshield washer jets, and even the door trim. Ross said they also pulled off the door sill plates and used them like skate boards as they ran down the road with them under their front feet. Ross said, "For a baboon, to have a car to play with for a whole day is manna from heaven!" Hyundai sells the same car in the U.S. and is badged the 2013 Elantra GT. The five-door hatchback made its North American debut at the Chicago Auto Show earlier this year. The car is slated to hit showrooms in the U.S. sometime this summer. Check out the durability test video below. That's the coolest idea I've seen since Samsonite did it with luggage..